Prominent & Leading Manufacturer from Ahmedabad, we offer used engine oil recycling plant. Our firm has been successfully satisfying the varied requirements of our esteemed customers by providing Used Engine Oil Recycling Plant. We have production area with experienced team to manufacture these plants. 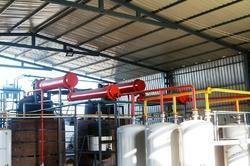 This plant removes degraded additives, carbon residue, fuel, aromatics, body moisture etc. from used engine oil and gives Re-Refined Base Oil with No smell and high viscosity. We handover plant to customers after complete installation and taking 5 trial batches for full satisfaction of customer.